Finding the used truck parts that best fit the needs your truck has never been easier. Whether you are located in Colorado, or around the world, we are ready to provide the heavy-duty truck parts you need, while saving you time and money. Fast service is one of the foundational aspects of Active Truck Parts. We know that the less time you can spend worrying about vehicle maintenance, the more time you will have to focus on the success of your business. That is why we make it our aim to provide an efficient used heavy truck parts shopping experience that gets you the used truck parts to keep you on the road. Our wide selection of heavy truck parts makes it easy to find exactly what you are looking for. You can choose from used truck parts or aftermarket truck parts, and from heavy duty truck parts or light duty truck parts. Our website provides the tools for you to search as specifically as you need, down to the manufacturer and year of the used truck part you are searching for. Along with our wide selection of used heavy duty truck parts is an experienced and knowledgeable used truck parts specialist team. We know heavy duty truck parts and are always available to work with you to find the used truck parts that you need. Whether we find it in our used truck parts inventory or have to search within our large network of dependable partnerships, our team is focused on providing the best possible service for you and your truck. Our efficiency serves as the pillar of our business. Yet it is not the only thing that sets us apart from the rest. We pride ourselves on selling used, O.E.M truck parts that save you money without sacrificing quality. By purchasing our used truck parts, you can save 25-80% on what you would be paying for new truck parts. And you are not simply saving money on cheap and mediocre heavy truck parts, but you are saving on used truck parts that were manufactured using the same processes and materials as your original part. This means that you are not losing quality and you are receiving a used truck part that is built specifically for your truck. We believe in the importance of what you do. 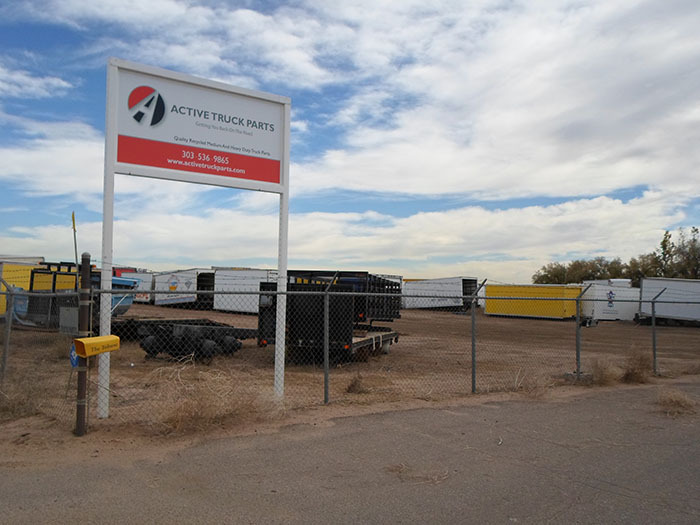 Choose Active Truck Parts, and you will find the used truck parts and customer service that saves you money and gets you back on the road faster. Don’t live in Colorado? Don’t worry! We ship our used heavy truck parts anywhere in the world, so wherever you are, we will ensure that you get the parts and the service that you deserve.